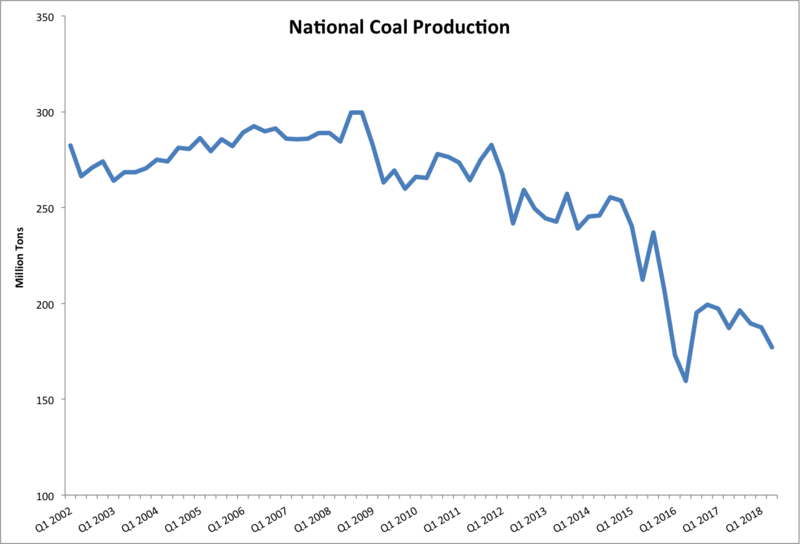 In 2015 and 2016, a string of coal companies declared bankruptcy as coal production dropped precipitously, hitting a low point in the second quarter of 2016. Shortly after, President Trump was elected. Trump’s campaign focused heavily on coal, and he has continued to claim that he will bring coal jobs back. While coal has rebounded slightly, that rebound began before Trump was elected, and gains have remained modest. The national rebound hit its highest point so far in the last quarter of Obama’s presidency. The slump in production in 2016 followed a record number of coal-fired power plant retirements in 2015. The price of natural gas has remained low over the past several years, and the cost of renewables has continued to decline, leading more coal-fired plants to become uneconomical. A record number of coal plants are predicted to retire by the end of 2018. 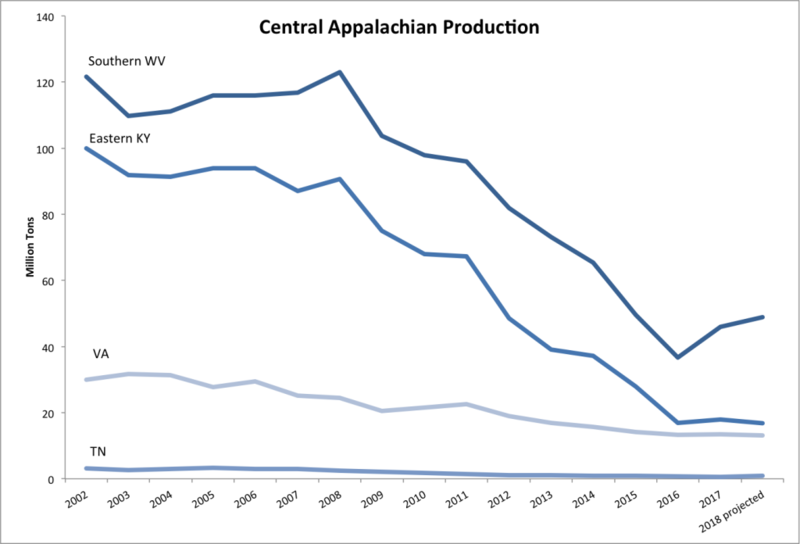 Central Appalachian coal production has been particularly hard hit in recent years. 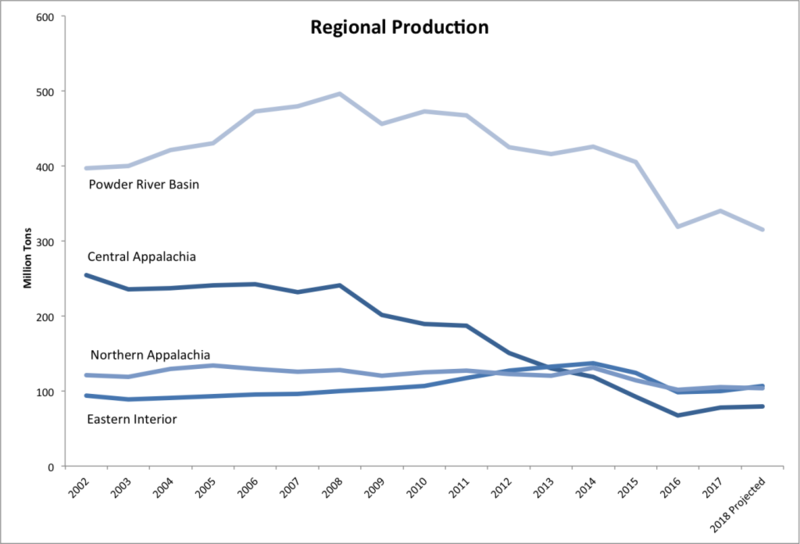 The cost of mining and transportation in the region is relatively high, making Central Appalachian coal even less competitive in the national market. However, a recent surge in the price of coal used to make steel (known as metallurgical coal) and a spike in exports has driven an increase in production. This is especially true in southern West Virginia, where this higher quality metallurgical coal can be found. The spike was spurred by a hurricane in Australia that shut down railways used to export the country’s metallurgical coal, and it may be short-lived, as mining and transportation costs limit export potential in the United States. A new set of bankruptcies in October has further highlighted the coal industry’s plight. In October, Westmoreland Coal Company and Mission Coal Company both filed for bankruptcy. Most of Westmoreland’s recent coal production has come from mines in Montana and Wyoming, but the company has a long history in Central Appalachia. In contrast, Mission Coal company formed early in 2018, as the latest in a long string of complicated moves orchestrated by a relative newcomer to the coal industry, Tom Clarke, who has pursued a strategy of purchasing mines out of bankruptcy. Another longtime player in the Central Appalachian coal market may be doubling down on mining — Alpha Natural Resources and Contura Energy announced completion of a merger November 9. Contura was created by Alpha shareholders in 2016 during Alpha’s bankruptcy reorganization. Contura acquired what many saw as the more lucrative mines in the Powder River Basin, Northern Appalachia and Central Appalachia. But Contura chose to sell its two large pit mines in Wyoming, once seen as the “crown jewels” of the company, after struggling to sell the low-heat-value coal. Presumably, the company will focus on metallurgical mines in the East. The new merger will make Alpha Natural Resources the largest metallurgical coal mining company in the country. The recent volatility of the coal market has led to a slew of changes for companies. Between bankruptcies and surges in the metallurgical coal export market, some companies appear to be banking on opportunities for short-term gain. Similar bets on the metallurgical coal market in 2011 led to the downfall of other industry giants, like Arch Coal. These deals rarely work well for miners or the communities living around mines. The metallurgical market can only prop up the coal industry for so long. Rather than being treated as coal’s comeback, this reprieve should be treated as one last opportunity to achieve a smooth transition for our coal mining regions. It’s vital that the region uses the revenues from the current, temporary boost in coal production to ensure that miners receive black lung benefits, contaminated sites are cleaned up and new economic opportunities are created. Other countries, such as Spain and Wales, provide models and lessons learned for ensuring that coal miners are not forgotten in the transition.